Pi Quan (Splitting fist) is the most important form in Xing Yi Quan. The understanding and mastery of Pi Quan is synonymous to understanding and mastery of Xing Yi Quan itself. All the other forms and movements such as 5 elements, 12 animals, 8 forms, mixed forms, stable body canon, various weapons etc. can be seen as elaborations and commentaries on Pi Quan and hints to unfold various aspects of it to eventually realise its profound meaning. When I was studying Xing Yi with Sun Jian Yun in Beijing the three things she emphasized most where San Ti (Trinity stance), Pi Quan and Beng Quan (crushing fist). One time after I just had learned An Shen Pao (stable body canon, a long pair practice form) I felt very happy as it explained a lot of the applications and fighting tactics in Xing Yi to me, so I told her I was very grateful for learning the An Shen Pao form since I felt it held a vital key to understanding Xing Yi. She looked at me and smiled. Then she said I already taught you the key to understand Xing Yi, everything you need to know is in Pi Quan. If An Shen Pao does not help you understand that, it is better to forget that form and just practise Pi Quan until you get it. On another occasion she said: In Ba Gua Quan we have Single Change Palm as the basis of the art, in Xing Yi we have Pi Quan. Although these two are different, they both are ways to express rising, drilling, falling and overturning. “Rising, drilling, falling and overturning” is just another way to say “changes between Yin and Yang”. 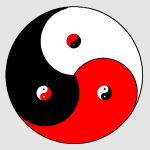 If you really understand “changes between Yin and Yang” then you can do as you wish, any movement will be correct. If you do not understand this, even practicing ten thousand movements will be of no use. In order to understand, you need to practice diligently and research the basics thoroughly. Therefore our boxing is simple and profound with few forms and techniques so you don’t get confused thinking the secrets are in complex forms and movements. Splitting fist belongs to the Metal element and spans across rising and falling. The previous 4 sections [explaining San Ti] emphasize how trinity creates the ten thousand things. Trinity (San Ti) is always about the interaction of Yin and Yang i.e. the interaction between up/down and inner/outer. Therefore the form is like the grand ultimate (Tai Ji), the unification of trinity and the tranquil Qi. When Qi moves things are created. This is called crossing (Heng) and belongs to earth. Earth creates everything. There are 4 powers (virtues) in crossing. According to the 5 elements cycle earth produces metal. Therefore splitting fist is practiced first. It is the beginning and end of rising and falling and the physical manifestation of intention (Yi). Belonging to metal it has the shape of an ax and internally it is related to the lungs. In boxing it is expressed as splitting. When its power is smooth, the lungs will function harmoniously. If the power is wrong, the lungs will have perverse Qi. Qi is vital to man. Integrated Qi makes the whole body strong while perverse Qi makes the body weak. A weak body causes disease and the boxing will be obstructed and ineffective. For these reasons splitting fist should be studied first. One way to view splitting fist is to regard it as standing post (Zhan Zhuang) in motion. You move from one “three body stance” (San Ti Shi) to another. When practising this way, the three body stance is emphasised. You stand for a few minutes in San Ti and then change to the other side. The changes are slow, stable and deliberate. This way, getting from one end of the room to the other could easily take half an hour. As the capability to maintain whole body power is developed, standing periods are gradually shortened but still practised without expression of force, just as a way to learn to maintain whole body power regardless of standing or moving. All the essential principles that was studied when learning the three body standing post must be carried over into the practise of Pi Quan such as emptiness/fullness, yin/yang, pre-natal / post-natal, jin, qi, yi, 6 harmonies, rooster’s leg, dragon’s body, bear’s shoulders, tiger’s head embrace, eagle claw etc. 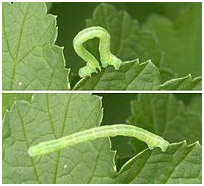 Walking like a caterpillar is both an image for “moving root” and “contraction and expansion”. Contraction and expansion will be explained later but moving root means we root firmly into the ground with each step just like the caterpillar, which has “feet’s” at the head and tail that firmly grasps the ground. It extends forward and grasps with its front “feet” and then pulls in the tail. In the same way we grasp the ground firmly with our feet on each step and don’t move the foot until the other foot is firmly rooted. Rise, drill, fall, overturn is in Pi Quan expressed both in hands and feet. To rise is to go out, drill is to enter, fall is to go in, overturn is to close. Each movement is hitting but also redirecting. Crossing means beginning; following means falling; rising means drilling; falling means turning over. Beginning is crossing and falling is following. Rising is the beginning of crossing and drilling is the end of crossing. Falling is the beginning of following and turning over is the end of following. The head is drilling when it is propping up and it is turning over when it is contracting. The hand is drilling when it is beginning and it is turning over when it is falling. The foot is drilling when it is rising and turning over is falling. The waist is drilling when it is beginning and it is turning over when it is falling. The crossing is concealed when beginning and crossing; the following is concealed when falling and following. Rising is going and falling is striking. But really both rising and falling are striking. To strike in rising and falling is just like the turning of waves. Contraction means drawing in towards the centre and expansion means the opposite. The contraction and expansion of the five bows (arms, legs and back) is of utmost importance. In some forms of boxing contraction is to store power and expansion to release it used in the sense of first storing and then hitting but in Xing Yi there is no count to two – both contraction and expansion is hitting. These are sometimes called “The three old fists” (Lao San Quan) or just three fists. The three fists are the basis of all the movements in Xing Yi. Although they can be practised separately, these three fists are also contained in Pi Quan. Wrapping is the practice of grasping, pulling and turning. Grasping should be like an eagle catching its prey. Pulling and turning is connected to the turning of the lower belly (Dan Tian). Without that, wrapping will lack power. Drilling fist is like lightning. Drilling is the practice of rising and piercing. In application it is used to counter-attack when one is in passive position hence it springs from the wrapping fist which closes at the hips. Cutting fist is like a horse galloping. In application it is hidden, waiting to be released. This is why it is concealed behind forearm of the other hand and travels along the forearm of the other hand on its way out. Jiǎn (剪) means cutting like with scissors. Some people prefer to use stepping (践, Jiàn) instead. In Pi Quan this move is both cutting and stepping so both descriptions are valid. Obvious power is crisp like crackers. Each movement is clearly separated. In application, emphasis is on hitting, striking, kicking, tackling, pushing etc. Obvious Power (Ming Jin), the main principle is to practice it according to the requirements that must not be changed, the movement of the body must be smooth and harmonious and must not be disharmonious. The rising and falling of hands and feet should be orderly and must not be scattered. This is the meaning of what the boxing manual says: “Square is to correct the center”. Hidden power is soft and smooth, continuously linked and flowing. In application, emphasis is on wrestling, throwing and joint locking. When practising hidden power, spirit and qi should be relaxed and smooth, and must not be restrained. The exercise should be rounded and lively and must not be stagnant. This is the meaning of what the boxing manual says: “Roundness is how to respond outwardly”. Change – Hua is the ability to change at any point i.e. if blocked or the opponent moves I can change the direction to overcome his counter at any point in the execution. e.g. midway in doing Pi Quan I change to beng quan because of the response of the opponent. It is also the ability to vary the actual expression of the form. In single practice I can for example do Pi Quan high, low, left, right, turning, entering, retreating, etc. The ability to issue force at any point during a movement from any point of the body in any direction. Redirection of the opponents force e.g. if he does a Pi Quan I can do Pi quan and when our forearms meet I use Heng Quan energy in my arm to change the direction of his Pi Quan and continue to enter with my Pi Quan. In application, emphasis is on doing without doing, using no technique when redirecting and striking, freely following and expressing according to circumstance. When practising transformative power, your whole body and each of your four limbs must never be moving and turning, lifting and dropping, advancing and retreating with effort, but should be wielded with concentration of spirit and intention. Although wielded with spirit and intention, the shape and postures must follow the rules as in the above two and must not be changed. Although no force should be used when moving the body, however it is not that completely no force is used. Heart (Xin) and intent (Yi) always permeates. This is the meaning of what the boxing manual says: “Three Cycles and Nine Twists are One Form”. 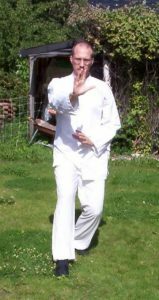 The three ways of walking are ways of practising Pi Quan. They are related to ways of expressing power but not in the sense of being linked directly. One step at a time, each one clearly separated and rooted just like the caterpillar, like the “moving root” or “moving post” practice mentioned in the beginning. In live stepping the principle of “in entering, back foot follows, in retreating, front foot follows”6 is expressed. There is no holding of posture; each movement’s ending is already the beginning of the next. For Pi Quan this means that the back foot follows immediately in the drilling phase and that the back foot follows in the final cutting phase. In moving step practice you are constantly moving and executing Pi Quan. Fixed stepping is very good for developing the foundation of each power so it should be practised first. Fixed stepping allows you to discern various aspects and principles. Live stepping emphasizes whole body moving as a unit and allows you to combine everything into one. Walking stepping further emphasizes aliveness, integration and timing and should only be practised after some basic understanding of fixed and live stepping has been achieved; otherwise the whole form tends to become too loose, unfocused and messy. There are many different ways of practising moving step but the two fundamental ones are walking step and improvised step. 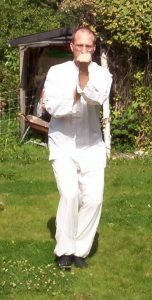 In walking step practice you are constantly walking and executing Pi Quan. The timing of hands and feet are slightly different than in the other stepping methods in that the wrapping part is executed with a step. In improvised stepping there is no fixed pattern. Left, right, forward, back, turning, jumping, short and long spontaneously arises. It is a version of the practise of boxing dance (shadow boxing) (拳舞, Quán wǔ) but applied to only this one form. Dan Tian (丹田) is the energy centre in the lower belly. It also coincides with the physical balance point of the entire body. While standing post practice is nourishing Dan Tian (养丹田) by sinking the vital energy (气) there, in Pi Quan one practices the fundamental ways of expressing power driven by this centre of the body. There are three ways of moving the Dan Tian to power movements in Xing Yi i.e. Contract/expand, turn inwards and outwards (also called swallow and spit), and rotate. Note that some people breaks it down into swallow/spit, float/sink, (and sometimes adding) open/close. While this is an alternative way of describing it, I find contract/expand, turning in/out and rotate to be more accurate from a Xing Yi perspective. Of the three ways to rotate (vertical, horizontal and lateral) the rotation in Pi Quan is primarily on the vertical axis with some horizontal rotation but very little lateral rotation. Practising variations is important both for ability to actually apply Pi Quan in self-defence but also to experience Pi Quan from a different perspective. Similar to poly-ocular vision where two eyes are watching the same object from slightly different angles provides the ability to perceive the dimension of depth much clearer, practising Pi Quan in different ways helps to provide a deeper understanding of its fundamental principles. Again it is important to have a good foundation in one way of doing it, otherwise it will just be a bunch of random movements and will result in shallowness instead of depth. Flat palm (平掌, Píng zhǎng), favoured way in many Hebei styles of Xing Yi. In Sun Lu Tangs book A study of Xing Yi Quan he shows this variation. 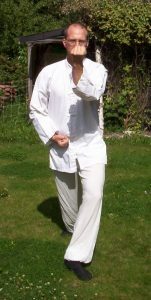 Clenched fist (握拳, Wòquán), favoured way in Che style, Dai style and Shang styles of Xing Yi. In Sun style we use this variation e.g. in “five elements creating and destroying” pair form. The basic direction of turning the fist is from inside out (外翻, Wài fān). Another way is to turn from outside in (内翻, Nèi fān). Other variations are numerous but some examples are: back hand, sliding forward (same foot all the time), sliding back, stepping back, double hand strike, directing power down, straight or up, etc. Start with some warm up exercises e.g. dao yin or some gentle loosening exercises and a few minutes of jump rope or running. Do fixed step Pi Quan for at least 10 minutes. Pay attention to one of the aspects described above such as “Walking like a caterpillar” or moving step Pi Quan and drill into that. San Ti standing and Fixed step Pi Quan are the basics and it it is good to always practise that. After that focus on one other aspect as outlined above. There is not much point in trying to cover everything in one practise – this will only lead to “lots of stuff but no accomplishment” (yi shi wu cheng). However, after having practised for some time then it is good to sometimes cover a lot of ground and see if you are indeed expressing the same essence in the various ways of practising Pi Quan.